It was a beautiful day on top of Mount Spokane. The sky was clear and blue. We had a great view of the fresh air we were protecting. Being in a remote location, we did not draw many of the public. Yet we were in a high-traffic area for bikers and hikers. They appreciated zero-emissions vehicles. After all, bikes and boots are great green forms of transportation. The Think City, with its space frame and plastic body, always catches attention. The Teslas are always a conversation piece. We showed how much gear fits in a Leaf. A big surprise was when an electric engineer cruised up the hill on a scooter of his own making. His lithium-ion battery pack fit in an Otter Box he could carry around. Some drivers used up 80-90% of their charge climbing the hill, creating some anxiety, but regenerative braking alleviated that on the way home. My Leaf left the mountain with 5 miles of range and 1 bar. I pulled into my garage 24 miles later with 14 miles and 2 bars. I learned something. Stay current. Go solar. Drive electric. What pairs perfectly with mountain air in the morning? The scent of bumpers without tail-pipes. Fresh coffee and donuts will round out the bouquet. 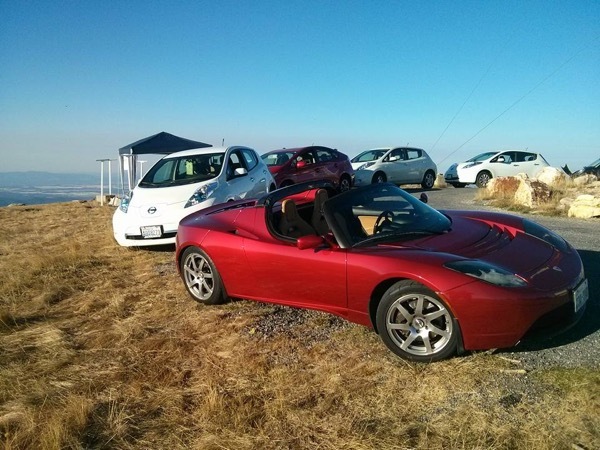 Let's kick off National Drive Electric Week by getting a traffic jam of Zero Emissions vehicles to Mount Spokane Summit at dawn. Get a good look at the crisp sky and evergreen wilderness we're trying to protect. And on the way down, prove the power of regenerative braking. Arrive early while the donuts are still hot. Show a carful of friends how electric torque eats up hilly roads. They can talk about the Nissan LEAF® with representatives from our sponsor Jaremko Nissan. And don't forget to join us the following Saturday at our Liberty Lake National Drive Electric Week event. We're celebrating NDEW bumper to bumper. Registered attendees report 244,391 electric miles driven.